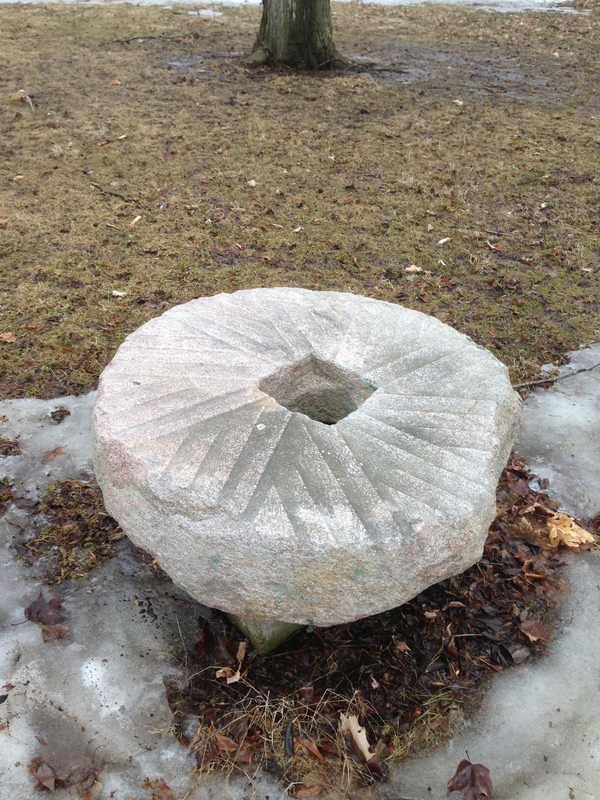 One of the original millstones at Dayton, now on display in Shabbona Park. When the Green party arrived in Illinois in December 1829, they moved into the cabin that William Clark had built for them. It was 18 feet by 24 feet, and in that single room, fourteen adults and ten children (four of them under two years of age) spent the first winter. As soon as possible in the spring, trees were felled to make a sawmill and the roots of the trees were used in making the dam. Jesse and David Green, ages ten and twelve, were given the task of scraping out the raceway for the mill, with a pair of oxen and a scraper each. They finished their work just as the mill was ready. The sawmill was built with enough room at one end for a pair of grindstones, and on July 4, 1830, the first wheat was ground by water power in northern Illinois. Barbara Green baked bread from that flour for their Independence Day meal. When these first mill stones were replaced, they were placed in Shabbona Park, where they may still be seen.